Tonight is Monday Night Football and in celebration today the 2015 #MetLifeTakeover video is here! The Dolphins might have lost the game but looking back in 10 years hopefully all we will remember is how much fun we had! This video was shot by Greg Jeske and edited and hosted by Alex Bente. It featured interviews with Nat Moore, Tom Garfinkel, Andrew Abramson, Solo D, The Fintroopers and even Ace Ventura! Plus there is dancing… lots of dancing! Thanks again to our sponsors Pabst Blue Ribbon, Sailor Jerry and AquaHydrate! Thanks to everyone who helped with the tailgate and everyone who helped with this video! Honestly I don’t really know what else to say but watch the video and show it to everyone! Phins up! 2015 #MetLifeTakeover from Dolfans NYC on Vimeo. Posted in Events, Recaps, Video | Comments Off on 2015 #MetLifeTakeover Video! This season has obviously been disappointing and Sunday was pretty much a disaster on the field but off the field we had a hell of a time. 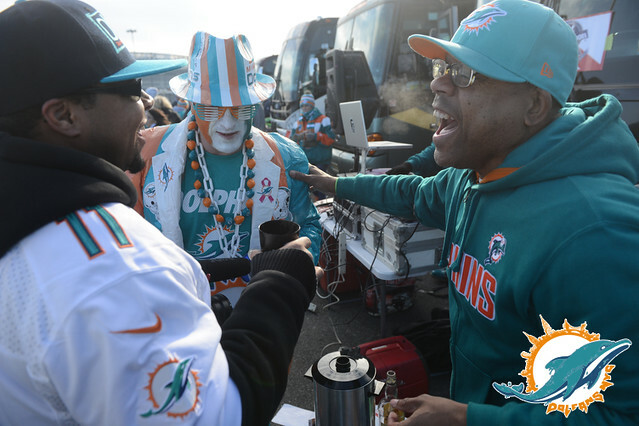 It’s hard to explain to someone who has never been to a #MetLifeTakeover but there is truly no better experience as a Miami Dolphins fan. Obviously I am a bit biased but when you get to tailgate with hundreds of fans and then all walk in and sit with 1000 Dolfans and make so much noise that you can hear us on TV even in a disaster of a game it’s the greatest feeling in the world. In the fourth quarter we were getting killed and for some reason most of the Jets fans had already left the game. A lot of Dolphins fans had left too, but our section was still filled with a ton of die hards. The Dolphins scored and we sang the fight song as loud as we could. We then recovered and onside kick and were cheering like crazy. Then, the Dolphins being the Dolphins, we fumbled the ball and the few remaining Jets fans started laughing at us. I turned to our remaining crowd and started chanting “Let’s Go Dolphins” as loud as I could. The rest of crew joined me and all you could hear was “Let’s Go Dolphins” despite just turning over the ball on the fourth quarter of a blow out. It was one of my proudest moments as a Dolphins fan. It’s easy to be a fan when you are winning. It takes something special to root for your team when you are terrible. Reshad Jones Tweeted “When you winning, everyone is your friend, it’s easy to be on the wagon, so a SPECIAL shout-out to the ride or die fans! !” and we showed everyone we are out here riding for our team! We had a blast! Our four busses made it to the tailgate by 9am so we had hours to party. DJ Tropic DJ’d the whole thing which really upped the game from the last few years. Solo D and his Miami Sports Music/ DWA crew perform. We had a catered tailgate and Pabst Blue Ribbon donated 600 beers! We had water from AqauHydrate and Sailor Jerry Rum & cider. We are so lucky to have such rad sponsors. We raised nearly $3000 through donations and merch sales which when you add to the money we made at the #MetLifeTakeover Pre-Party was close to $5000 that we can donate charity for the weekend not including the money we made from ticket sales. Plus we had a ton of people bring toys to continue the toy drive we did from the night before. Really amazing. Thanks so much everyone! We had some cool guests at the tailgate as well. Dolphins legend Nat Moore and CEO Tom Garfinkel showed up at the tailgate which is always awesome. They have been big supporters of what we do up here. We also had Andrew Abramson from the Palm Beach Post and Brent Grimes infamous wife Miko show up as well. Miko has come to all our tailgates and this is Andrew’s second one so I appreciate the support from them. We even had some Jets fans come by to talk some smack. But they are the guys responsible for flying banners over the Patriots practices to troll them so I guess they aren’t so terrible. Anyway, it was a terrible game but another amazing experience. Let’s just hope next year’s Takeover isn’t on Thanksgiving so we can bring out even more Dolfans and get another win. Since the first big #MetLifeTakeover this is our only loss so I think we are doing pretty well overall. Phins up! Now check out all the photos from the tailgate! Posted in Events, On The Road, Photos, Recaps | Comments Off on 2015 #MetLifeTakeover Photos! Okay we get it. The Dolphins aren’t good at football. But that doesn’t mean we can’t still enjoy the football season. We had a fantastic weekend here in NYC even if the last three hours of it were really terrible. Our weekend started off with a party at our bar Slattery’s Midtown Pub on Saturday. We invited our normal crew plus anyone who was in town for the game to a three hour meet and greet kinda thing and it was a ton of fun. We had people there from Indonesia, the UK, Canada and of course TON of people from Florida. It was a great turnout and we raised a lot of money. We had DJ Tropic DJ and Solo D perform and of course we had a big raffle where we raised about $1000 for charity. 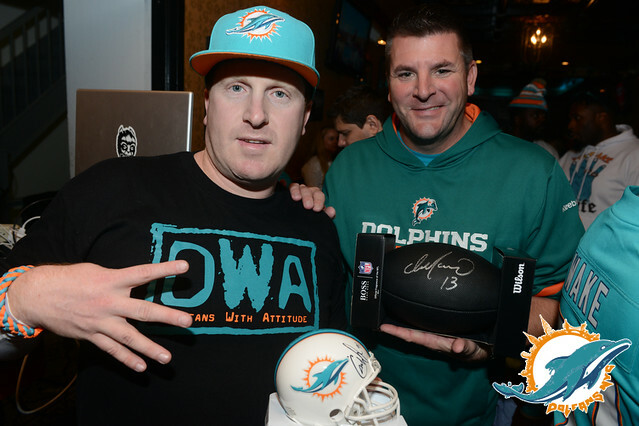 On top of that we did a live auction to benefit the Dan Marino Foundation where we had a Marino signed ball go for $400 and a Cam Wake signed mini-helmet go for an insane $310. We decided to round up and we will be donating $1000 to the Dan Marino Foundation to help people with autism and other disabilities. 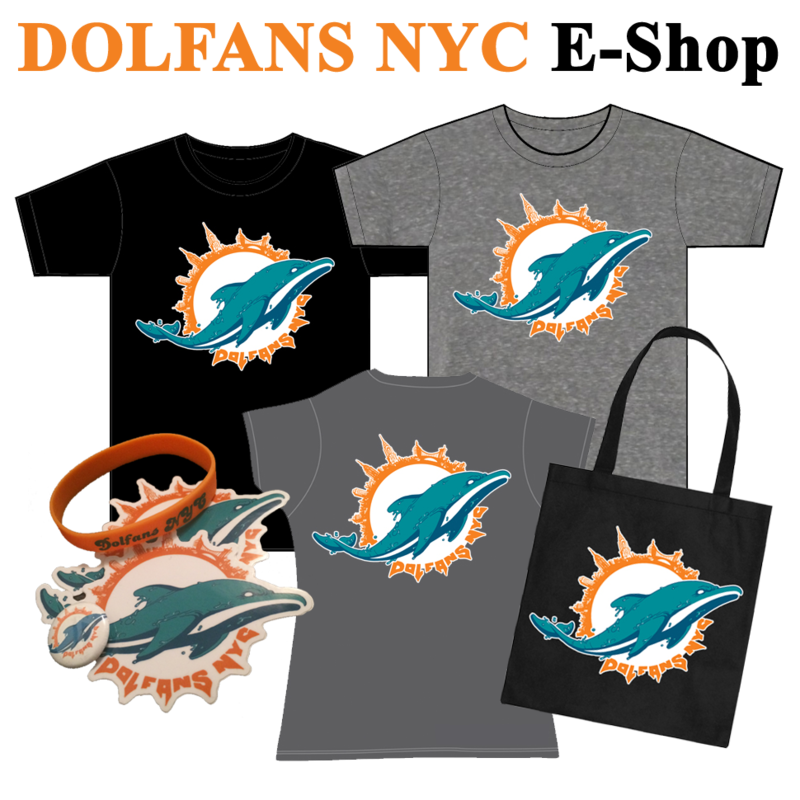 Lastly I just wanted to thank the Miami Dolphins, Pabst Blue Ribbon and Dolfans NYC member Rambo for donating items for the raffle and of course our volunteers for helping out! You guys rule. Now check out some photos from the event! If you want to save an image you just have to double click it in the gallery and it will take you to the actual page on Flickr.